*Auction 7, Vintage Round 2* Absolutely spectacular '52 Mantle on the auction block this month. The offered copy represents the finest Berk Ross Mantle we've brokered in our tenure and is among the best examples in the hobby. An incredibly rare issue which is virtually impossible to improve upon. The offered '8' boasts vibrant surfaces with bright color, exceptional print and outstanding registration. Beautifully centered with four pin-point sharp corners and strong card stock. 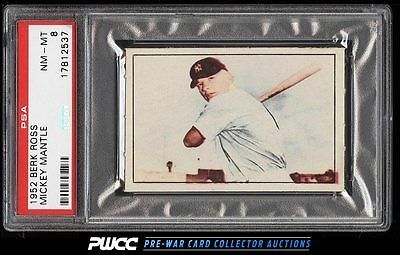 Within the hobby '52 Mantles continue to soar in value and the Berk Ross is poised to blow up with it being the rarest of the '52s. Comes with our highest recommendation and is deserving of attention. One of nearly 20,000 cards, lots, and sets up for bid in our 7th Auction of 2016. Click on the link above to view the other PWCC auction lots.